Sometimes two things that seem to share nothing in common are actually connected by a gossamer thread, an unseen strand that exists only in the artists’ mind. Inspiration. It can come from anywhere at any time, merging unique things together into a brand new artistic experience. 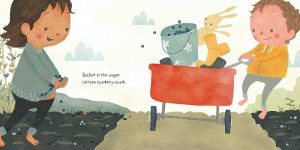 The initial seed of inspiration for Bumpety, Dunkety, Thumpety-Thump came from reading Eric Carle’s The Very Busy Spider to my young son. Ashton was only a toddler at the time, but he loved to run his fingers over the raised lines of the spider’s web. As a picture book author who has also worked in publishing, I know that “extra” features, like the raised line, cost publishers more money, which is why they are rare instead of common. Yet I wished there could be more books like this on the market because children love to explore textures. I wondered if there might be a way to recreate a tactile sensory experience using words. That’s when I thought about yet another wonderful read-aloud picture book. Chicka Chicka Boom Boom by Bill Martin Jr. has been a favorite since its publication by Simon & Schuster in 1989. Could rhythm help to replicate the senses? I decided to create a text that used words and rhythm to bring alive the sounds and textures of the world around us, and hopefully in the process, invite children into an imaginative state where they can experience the bumping, thumping, playful world all around us. 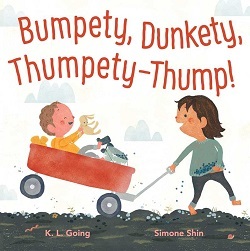 The result is Bumpety, Dunkety, Thumpety-Thump. I hope you and your little ones will enjoy the experience of reading this book together!